This Auburn Tigers NCAA keychain lanyard, is perfect for any true Auburn Tiger fan. 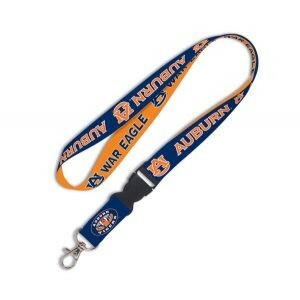 This Auburn Tigers NCAA keychain lanyard, is perfect for any true Auburn Tiger fan. Made out of heavy duty nylon, this key lanyard displays bright Auburn Tigers colors, and logos. Is also very comfortable and soft around your neck. Also is detachable. Approximately measures 24" long, 1" wide. Ideal for holding keys, ID's, and Badges.